We’ve all had those days when a trip to the grocery store feels a little out of reach. Allotting time out of your busy schedule, circling the parking lot for a spot, wandering the aisles for what you need (cue the impulse buys), standing in the checkout line, then carrying your bags to your car - all contribute to why for some, grocery shopping is a weekly struggle. Luckily though, like every other item you can buy online these days, your groceries are no exception, allowing you to buy them at the tap of a finger. In 2015, U.S. online grocery sales amounted to about $7 billion and are expected to rise to $18 billion by 2020. While the percentage of consumers shopping for their groceries online is just starting to grow (9% to be exact), the trends seem to be indicative of a new wave of buying behavior that is sure to shake up the grocery retail industry and online shopping as a whole. Who is clicking “add to cart” instead of pushing the cart? Not surprisingly, those over the age of 65 are not shopping online for groceries. According to this recent data, those ages 18-29 were most likely to shop online for their groceries, followed by 30-49 year-olds. Millennials and young, working adults are more likely to adopt online grocery shopping because they are more open to technology and seek out ways to make their busy lives a little easier. The same study noted that those living around the east coast of the U.S. and those residing in cities are more likely than their counterparts to shop online for their groceries. Working adults are almost twice as likely as those who aren't working to do their grocery shopping online. The study noted that income was not related to online shopping for groceries. On average, consumers make 1.5 trips to the grocery store each week. While that number could be cut down to zero with shopping for groceries online, not everyone has jumped on the bandwagon yet, for justified reasons. For example, shopping at the store provides instant gratification for your needs, it provides sensory experiences (like smelling bread or picking out that perfectly ripe avocado) that online cannot replicate, and it doesn’t come with shipping fees. With that said, more consumers are adopting new ways of accomplishing traditional tasks, creating a window of opportunity for any type of retailer to be online. Not only are consumers looking for these answers within seconds of entering a retailer’s site, but they’re also looking for value-added bonuses that would benefit their health, the community and the environment. Retailers should be aware of this so they can highlight these aspects on their site. 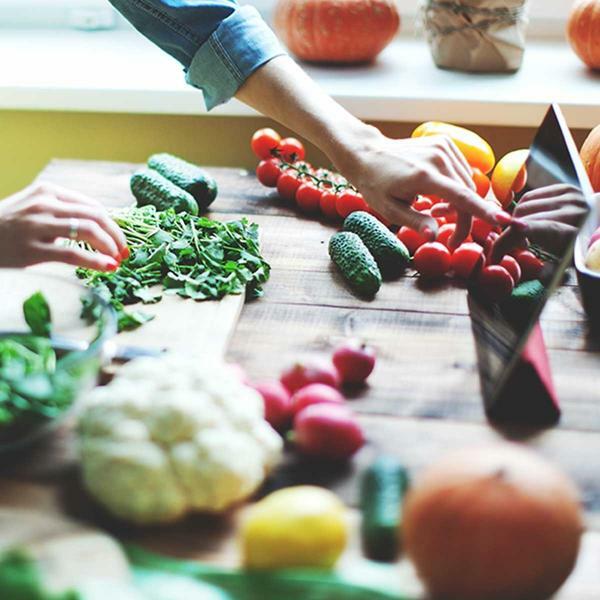 To cater to consumers with diet restrictions, for example, it would be beneficial to add categories to the site (like organic produce, gluten-free items, vegan-only items, etc.) as well as any fair trade regulations and responsible sourcing. To say Amazon is a trendsetter would be an understatement. In June of 2017 Amazon bought grocery giant Whole Foods for $13.7 billion - a move that created buzz and speculation around the grocery retail industry as a whole. The fact that Amazon now owns all 450 of Whole Foods’ brick and mortar stores has businesses and consumers curious as to how the traditional grocery shopping experience will change. They’ve already slashed the prices of many items (by as much as 43%) in-store, a move made to attract more lower and middle class grocery shoppers who may not have been able to afford its higher-than-most prices prior to the acquisition. Amazon continues to revolutionize online shopping as the frontrunner - at the end of 2016, Amazon accounted for 53% of U.S. online sales growth. That means their sales growth beat out all U.S. online retailers combined. In 2016, the online giant implemented Amazon Go, an experimental physical store located in Seattle, Washington that has no checkout stand or cashiers. You simply open the Amazon Go app, scan the QR code at the entrance of the store, pick which items you need, and go. Its system leverages technologies used in self-driving cars - including computer vision, deep learning algorithms and sensor fusion. It’s currently only available to Amazon employees, but serves as an example for the type of innovation that has everyone watching. Amazon has already capitalized on the grocery market through AmazonFresh. Anything from fresh fruit to kibble for your pooch, Amazon will send it to your doorstep. AmazonFresh competes with Walmart and other big name grocery brands who have started shifting their focus to online sales. While AmazonFresh is an excellent option for Prime members and those looking for a one-stop shop, big name retailers upping their digital marketing game have the opportunity to maintain its loyal customers through an online channel. Amazon is flipping the grocery shopping experience on its head. So what are other retailers doing to cater to the trend in going online? As the trend heats up, grocers are shifting their efforts to optimizing their digital presence. Vons, Ralphs, Costco, and recently Aldi are now offering a majority of their fresh and packaged food items online that can be made ready to pick up from the store or have delivered to your home. InstaCart is one of the biggest platforms that grocers like Vons and Costco are relying on to meet the online demand. InstaCart locates its nearest partner retailers to you and allows you to search by store and department. It also offers coupons online that you can redeem directly on each individual item, eliminating the need to fumble coupons at a checkout stand. InstaCart is currently working with Ralph’s, CVS, Gelson’s, Whole Foods, BevMo, as well as other large and small grocers by essentially having a personal shopper gather your items and have them delivered to your doorstep on the same day you order. Not just big name brands are going digital, however. A prime example of a smaller online grocer doing it right is Milk & Eggs, which serves the greater Los Angeles and Orange County area. Milk & Eggs prides itself on offering only the freshest produce and food/beverage items, outlining the fact that all of its items come directly from local farms to your doorstep in 24 hours or less. No middle men, distribution centers, long transit times or shelf life makes this an excellent choice for the health-conscious, time-strapped consumer who appreciates the environmental benefits that come along with ordering online. It’s everything you need for a DIY meal, packaged and waiting for you on your doorstep when you come home. If you haven’t seen ads or influencer posts about HelloFresh or similar meal kit delivery services, then we’ll break it down for you to demonstrate how this type of service is growing in popularity, and what it has to do with the online grocery shopping trend. While experts predict that the industry will be a multi-billion market by 2022, today about 19% of people say they’ve already tried a meal kit service. There are many brands competing in this sector (Blue Apron, HelloFresh, Sun Basket and Plated to name a few), but each one varies in price, quality, amount of packaging, delivery time, number of recipes, meal prep time and cleanup. Differences aside, they all have one thing in common: they’ve started to penetrate the social media space and it’s paying off big time. Micro and macro-influencers are helping get the word out by doing reviews and posting photos with the meals they’re preparing. Many of them offer discount codes for their following, which has increased usage and overall awareness. According to Nielsen, influencer marketing can drive annual incremental sales at a rate of 11x versus traditional digital advertising - demonstrating the powerful role these social advocates can play in boosting revenue. Furthermore, Facebook, Instagram stories and posts, blogs, affiliate marketing and customer reviews are becoming huge drivers for shopping decisions. Bottom line? People love food and they love social media. It has sparked new ways consumers are being exposed to food and CPG products, posing an exciting opportunity for grocery bands to enhance their online presence and cultivate relationships with its customers. Online grocery shopping isn’t for everyone, but the growth in this trend can provide valuable takeaways for any brand looking to expand their digital presence. These takeaways can relate to buyer behavior, online expectations, the impact of social media and more. As online grocers and food brands make their products available online, they must understand their consumers’ needs and tailor their site accordingly. Making sure image quality is high and navigation is easy for the online visitor are just a couple of no-brainers for the online retailer. Making it a smooth, simple and seamless online experience is key. Amazon and other big retailers are rapidly evolving their digital strategies to keep up with the demand of its hungry consumers. These consumers are savvier than ever, demanding only the best in product quality and customer service. Being able to provide high quality, fresh items at a savings to the consumer will result in a win-win for you and your growing customer base. Social media is bigger than ever. If you’re not already, start taking baby steps in monetizing your platforms. Create opportunities with influencers to get the word out. Provide discounts to new customers, digital coupons and referral codes. Join the social chatter and engage with the people who will spread positive word about your brand. The future for online grocery shopping looks bright as our schedules get fuller and our pantries get emptier. As eCommerce as a whole continues to grow, brands must stay digitally relevant and continue to improve their online experience.